Canine dry skin is associated with the progressive death of epithelial tissues (outer surface of the skin) and massive keratin accumulation (proteins that make up the outer skin layer) on the skin. Dogs affected by many bacteria, viruses, fungal and parasitic diseases of skin may develop dry skin. Other reasons include environmental factors and skin deficiencies. Canine dry skin is characterized by scruffy, dry and scaled skin along with other complications. A dog with dry skin is sometimes referred to as having “Canine Dandruff” which is another name for dead skin tissues. Diagnosis is purely dependent upon the clinical signs, symptoms and history. Treatment involves various drugs, natural and homeopathic remedies care and management of the condition. Parasitic infestation is another common reason for dry skin. Dogs infested with various species of mites and fleas surely show signs of dry skin. Mange is such an example, with dry and scaly skin a major or minor sign. Bacterial and viral infections, which may cause pyoderma (puss containing skin infection), can cause canine dry skin. 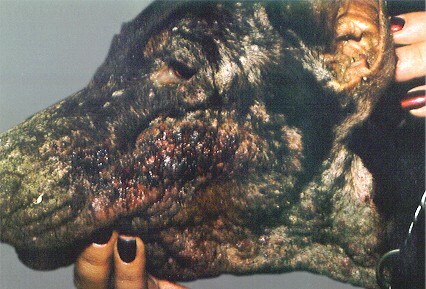 Extensive pyoderma in dogs may lead to scaling and hardening of the skin which is due to hardened skin tissues, which die due to severe infection. Advance stages of canine distemper can cause skin appearing dry and rough. Diet may contribute to dry skin. Dogs fed with low fat meals may develop dry skin, a rough and dry coat too. Dogs having habit of consuming relatively low volumes of water may also have dried skin tissues. Bathing and grooming are other issues associated with skin problems. Almost all dogs and particularly long haired dogs if bathed regularly, but not groomed properly and deep, may develop skin complications including dry skin. Hypothyroidism is a hormonal disturbance associated with canine dry skin. Dogs with dry skin may also have a coat that is rough and hardened. They may be found licking the area affected. The skin may be dry throughout or in patches, depending upon the cause of the problem. Most dogs affected with dry skin become disturbed and act annoyed by the problem. Some dogs may show signs of anger and aggressive behavior, even after recovery. A dog's coat can become dried due to the skin dryness due to a lack of moisture in the hair follicles and hair loss which can completely become dry or the coat may become dry in patches. Dogs may feel itchy, restless and may scratch dry areas. When a dog is combed, dog's may shed dandruff and dead tissue. Deep combing can cause painful skin bruising. Dogs with dry skin appear photosensitive as well. Some dogs with chronic cases of dry skin may have problems that result from this condition due to the exposure of deeper and sensitive connective tissues of skin, which are photosensitive. Such dogs usually avoid light and an open outdoors environment. It not treated, other complications could result such as skin cancer. Usually the appearance of dogs, symptoms and a brief history is enough to identify a dry skin dog problem. In order to eradicate the condition completely, a confirmatory diagnosis is necessary. An examination of deep skin scrapings and various blood tests may reveal the actual cause of the problem. Nutritional imbalances result in a through and distributed drying of skin, while on the other hand in a parasitic infestation partial, patchy or thorough drying of skin is noted. In bacterial or viral infections, along with dry skin, other signs of a typical infection are also seen. Topical application of different remedies and combinations are always the treatment of choice in Integumentary system (means skin) complications. Medicated topical dog skin treatments contain the ingredients pyrethrins, selenium, zinc and some oils like mustard oil and tree oils. Shampoos are considered to be more effective than lotions. Dry skin in dogs primarily requires a topical application of different formulations with the most important being “Shampoo Therapy”. Different shampoos are used depending upon the cause of condition. “Cleansing Shampoos” are usually preferred in those dogs having dried skin that developed due to environmental factors, such as pollutants and weather. These shampoos produce excess foam and lather well and thus reduce the effect of such dirt, weather and hardening due to pollution. One product that meets these criteria is Veterinarian's Best Quick Soothe Hot Spot Foam For Dogs . Other shampoos such as “Anti Parasitic Shampoos”, Medicated Shampoos” and “Anti Fungal Shampoos” are helpful in reducing the adverse effects of parasites, microbes and fungus respectively, causing a canine dry skin. Any shampoo containing Pyretrhins has an anti-parasitic effect and is good for fleas, ticks and lice such as 8 in 1 Perfect Coat Flea & Tick Shampoo. For mites and chiggers which cause mange or scabies, a natural lime sulfur dip is called for such as Dermisil. A good anti-fungal and anti-bacterial shampoo is Ketobenz. Along with shampoo therapy and lotions, nutritional planning is very important. Dogs once affected with dried skin and any particular skin problem like that of pyoderma and dermatitis, require nutritional plans that contain required nutrients. Nutritional supplements containing multi vitamins and minerals, especially zinc are very fruitful. Management and care should be improved for such dogs. Regular bathing, grooming, combing & care should be made compulsory especially in long haired dogs. Homeopathic veterinarians believe that in nature, animals instinctually seek natural herbs to support that various parts of the body. Treatments designed to improve the coat and skin contain herbs, nutrients and boichemic tissues selected for their supportive function on the skin and coat. One product made for this purpose and that is a good source of additional research on this topic is PetAlive Skin and Coat Tonic. It contains ingredients such as Equisetum arvense (silica for skin), Taraxacum officinalis (natural vitamin and mineral source) and Arthrospira platenis (chlorophyll for natural proteins and vitamins. ).